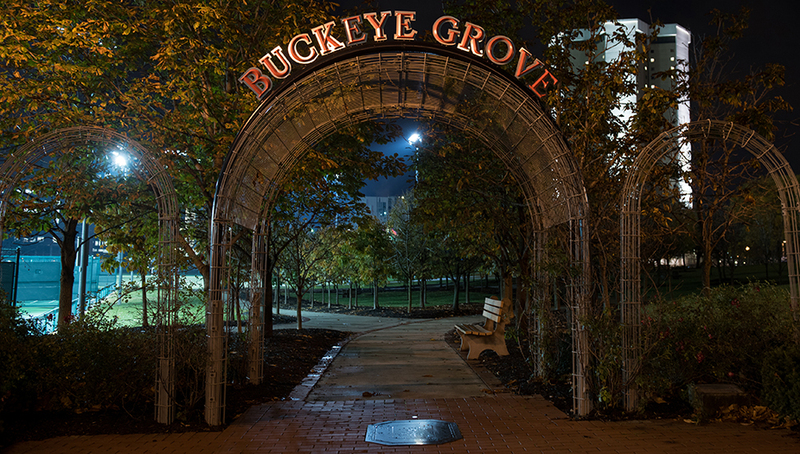 Two homes of the Buckeyes were recently honored for how they care for their trees. The Columbus campus of The Ohio State University and the Wooster campus of the university’s College of Food, Agricultural, and Environmental Sciences (CFAES) have each been named a Tree Campus USA by the national Arbor Day Foundation. 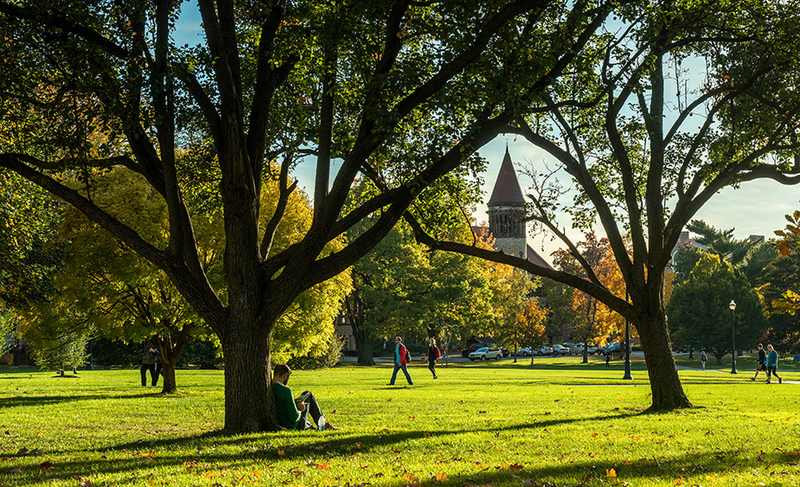 The designation, given annually, goes to colleges and universities for their commitment to effective urban forest management—for doing the work to have healthy trees where it’s sometimes a challenge to grow them. Recipients have to meet five standards, including having a campus tree advisory committee and a campus tree care plan. For the Columbus campus, it’s the eighth consecutive year earning the honor; for the Wooster campus, the seventh. Dave Benfield, director of the Wooster campus, said the Tree Campus recognition “attests to the passions” of the people involved—the campus workers and tree committee members—in conserving, caring for, and continuing to plant new trees. The two campuses’ tree committees have more than a dozen members each, including faculty, staff, and students from CFAES, from other parts of Ohio State, and many volunteers. Efforts include developing their campuses’ tree plans; planting, mapping, and inventorying trees; organizing service learning projects, and hosting Arbor Day celebrations. CFAES Forestry Program Director Kathy Smith, a member of the Columbus campus tree committee, said helping a campus’s trees is critical. “There are all sorts of pressures” on them, she said, from drought to pests to a range of stresses—compacted soil, polluted air, Frisbees—that come from being around people. And campuses often have lots of people. 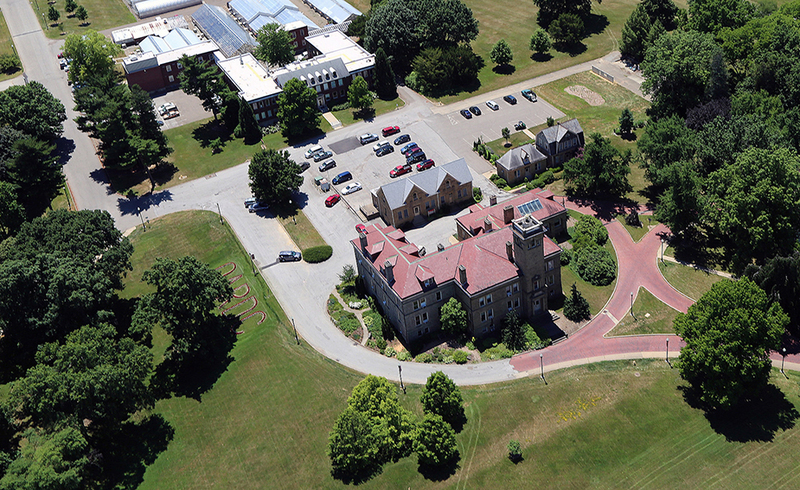 The Columbus campus, covering about 1,700 acres, has more than 60,000 students and 45,000 employees—along with, by one count, nearly 16,000 trees. Sycamores, maples, oaks, and others give shade on the Oval, the heart of the campus. Nearly 200 Ohio buckeye trees stand in Buckeye Grove at Ohio Stadium, each one honoring an All-America Ohio State football player. Some 3,600 trees alone grow in CFAES’ 62-acre Chadwick Arboretum & Learning Gardens. The Columbus campus tree committee, for its part, is currently working to “enhance the tree canopy and preserve our heritage trees,” said Mary Maloney, Chadwick Arboretum director and a member of the committee. The work “drives our planning and purchasing decisions to ensure the healthiest and most diverse tree canopy possible,” she said. The Wooster campus, located about 95 miles north of Columbus and 60 miles south of Cleveland, includes three main parts: the Ohio Agricultural Research and Development Center, CFAES’ research arm; Ohio State ATI, a two-year degree-granting unit within CFAES with about 700 students; and the 110-acre Secrest Arboretum. Roger Hamilton, grounds manager for the Wooster campus and a member of its tree committee, said the 400-acre campus core is home to more than 5,000 trees, from dawn redwoods—considered “living fossils”—to a 50-plus-year-old shade tree evaluation planting to the United States’ largest collection of flowering crabapples. Veil said trees give benefits beyond their good looks, including better health and wellness for people, greater energy efficiency in buildings, and money-saving ecological services such as stormwater retention. Trees are “critical green infrastructure,” Veil said. Some 17 colleges and universities in Ohio and 364 throughout the United States have earned the Tree Campus designation so far this year, the foundation reported. On all those campuses, Lambe said, “air will be purer (and) water cleaner” because of the work of their trees. For Benfield, trees’ benefits are clear to the eye. Visiting CFAES’ Chadwick and Secrest arboreta is free and open to the public seven days a week from dawn to dusk. Activities include not just learning about trees and other plants, many of which are labeled, but also walking, birding, and simply relaxing in nature. Both facilities also offer a variety of workshops, tours, and special events. Some are free; some have a fee. Chadwick Arboretum and the Wooster campus are both hosting Arbor Day celebrations on April 26. Chadwick’s, featuring the dedication of 32 new trees, will be at 10 a.m. on the west side of Kottman Hall. At Wooster, a tree planting ceremony is set for 3 p.m. on the front lawn of Ohio State ATI. Both events are free and open to the public. Details on the arboreta and their activities are at chadwickarboretum.osu.edu and secrest.osu.edu.